ArabSaga: Can 'friends' keep Syrian National Coalition whole? Can 'friends' keep Syrian National Coalition whole? 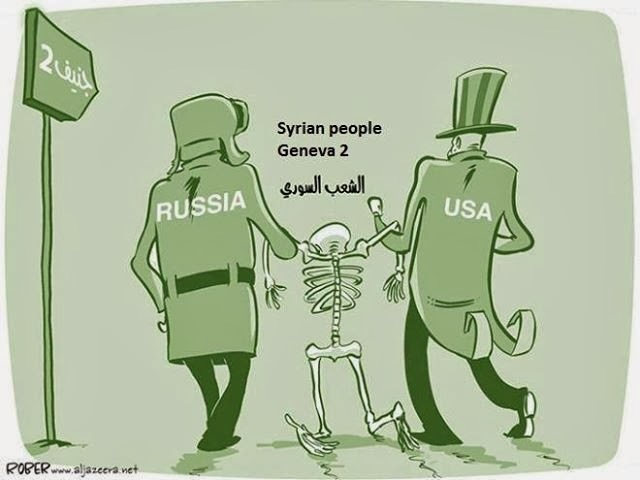 The Core Group of the Friends of Syria -- better known as the “London 11” -- will devote their Sunday, January 12, meeting in Paris to sweet-talk Syria’s opposition umbrella organization into attending the Geneva-2 conference. Abu Najm also quotes opposition sources as confirming the National Council risks splintering into factions after more than half its 121 members served notice this week they would walk away if the Council opted to sit at the Syria peace table in the Swiss resort of Montreux on January 22 (see my previous post, “The Syrian National Coalition is on its last leg”). The different factions in the National Coalition were unable to reach an agreement on participation at two days of talks in Istanbul this week and postponed a decision on the issue until January 17. The Syrian National Council, the main 28-member group in the National Coalition, is threatening to boycott the peace talks unless it has assurances that President Bashar al-Assad will be forced to give up power. The Syrian government has said it will attend the talks but that Assad's departure is not up for negotiation. The 11-nation core group of the “Friends of Syria” consists of Britain, Egypt, France, Germany, Italy, Jordan, Qatar, Saudi Arabia, Turkey, the United Arab Emirates and the United States. A statement by the Quai d’Orsay says Sunday’s meeting of the London 11 in Paris “will be chaired by Laurent Fabius, Minister of Foreign Affairs, and will take place in the presence of a Syrian National Coalition delegation led by its recently re-elected president, Ahmad al-Jarba. “This meeting will allow us to reaffirm our full support for the Syrian National Coalition and, in the run-up to the Geneva II conference, to reiterate our shared vision of a political transition addressing the Syrian people’s legitimate aspirations. The creation of a transitional government body with full executive powers is the central objective of the Geneva II conference. …I am now convening the Geneva Conference on Syria, and am pleased to invite you to attend the high-level international meeting that will launch the Conference. The Conference aims to assist the Syrian parties in ending the violence and achieving a comprehensive agreement for a political settlement, implementing fully the Geneva Communiqué, while preserving the sovereignty, independence, unity and territorial integrity of Syria. The Communiqué contains Principles and Guidelines for a Syrian-led transition. These set out a number of key steps, beginning with agreement on a transitional governing body with full executive powers, formed by mutual consent. As the Geneva Communiqué says, the public services must be preserved or restored. This includes the military forces and security and intelligence services. All governmental institutions and state offices must perform according to professional and human rights standards, operating under a top leadership that inspires public confidence, under the control of the transitional governing body. The Geneva Conference on Syria will convene under my chairmanship, first in an international high-level format over one day at Montreux, Switzerland, on 22 January 2014, beginning at 9 a.m. Negotiations between the two Syrian parties, facilitated by the Joint Special Representative for Syria, Mr. Lakhdar Brahimi, will follow immediately in Geneva on 24 January 2014. Adjournments and subsequent meetings may take place in accordance with a work plan to be agreed. The high-level international meeting may resume its deliberations as required. I am confident the international participants who gather in Montreux will offer meaningful support for constructive negotiations between the Syrian parties in Geneva. I am sure that all present will do their utmost to encourage the Syrian parties to reach a comprehensive settlement, fully implementing the Geneva Communiqué, within an accelerated time frame. In addition to participation in the high-level meeting, it may be necessary to call upon you to assist further as the negotiations between the Syrian parties progress. In inviting the Syrian parties, I have reminded them that the Security Council has called on them to engage seriously and constructively at the Conference, and underscored that they should be broadly representative and committed to the implementation of the Geneva Communiqué and to the achievement of stability and reconciliation. I have also reminded the Syrian parties that, consistent with the Geneva Communiqué as well as Security Council resolution 1325 (2000) and other relevant resolutions (Annex II), full and effective participation of women is essential. I look forward to confirmation of attendance of your delegation, and the list of delegates and advisers, at your earliest convenience. Confirmation of attendance will be taken as commitment to the aims of the Conference stated above, in accordance with the Geneva Communiqué, in particular the Principles and Guidelines for a Syrian-led Transition contained in it. The Office of the Joint Special Representative will provide a technical information note in due course.